Preachers writing books. Oh my! Actually, Clint Ritchie’s book Rebuilding the Family Altar is not the sermon rehash that many pastor-written/pastor-published books are. Instead, Ritchie presents a theoretical framework for family devotionals, and then presents 52 sample ideas. This does result in a book with a split personality. On the one hand, the first 60 pages are a friendly reminder of why we need to use home as the base for discipling our children. On the other hand, the last 60 are simple devotionals for family discussion. I’m not sure listing these as an appendix is the right label, but it’s not my book. Theologically, I would have liked to see a development of why we still use the term “altar” in the Christian world. Ritchie glosses over the use of altars as places of sacrifice and names them as places people connected with God. This is true, but it was meeting with God through sacrifice. In this, an explanation on how Jesus fulfilled that sacrifice would have been a benefit. The second 60 pages are, as stated above, like a second book. These are sample devotionals for family use. As samples, they are fine and work well. (As do others, such as the Whit’s End Mealtime Devotions series.) I especially endorse the idea of getting the Biblical text from the actual Bible rather than reading off a pre-printed sheet. This helps reinforce the value of reading from the Bible itself. I would have liked a few more discussion questions embedded in the devotionals, or perhaps a survey of suggested topics to cover. However, this volume is intended as a starting point rather than an encyclopedic view of the issue of family discipleship. 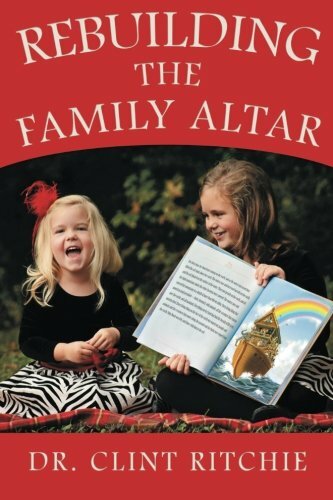 I gladly recommend Rebuilding the Family Altar to Christian families looking to kick-start their family worship times. Disclaimer: Clint Ritchie is a friend of mine. He has moved out of state, though, and so I do not fear any repercussions from him. So, the review is honest.